What is the public’s favourite John Lewis Christmas ad? November 09, 2016, 3:00 p.m. The John Lewis Christmas advert has become an unofficial start to the festive season, dominating airwaves and analysis both in the marketing press and the mainstream media. But as the nation waits for the release of this year’s spot, which of the past John Lewis ads have best resonated with the public? Using two measures from YouGov BrandIndex, we can assess how the public feel about the last three years’ adverts. The first measure is ad awareness. This assesses how many people have seen a brand’s advertising over the previous two weeks. Given what we want to measure is the change in this score from the day the adverts were released, the figures have all been indexed to zero on the day the sports premiered and we have looked at the first 21 days after the adverts were unveiled. One thing that is clear in this data is that year-on-year the adverts have been picked up more immediately. While part of it will be due to changes in when the advert were run, a large part of it is also probably because of the attendant hype that comes with a John Lewis Christmas ad. So, while the Bear and the Hare got off to a good start, the Man on the Moon flew out of the blocks. Another thing of note is that while the 2013 advert got off to a slower start, it stayed stronger for longer. While the 2014 and 2015 spots hit their peak ad awareness score in the second week, the Bear and the Hare reached its pinnacle in the third week. It having longer legs made it the more successful advert. 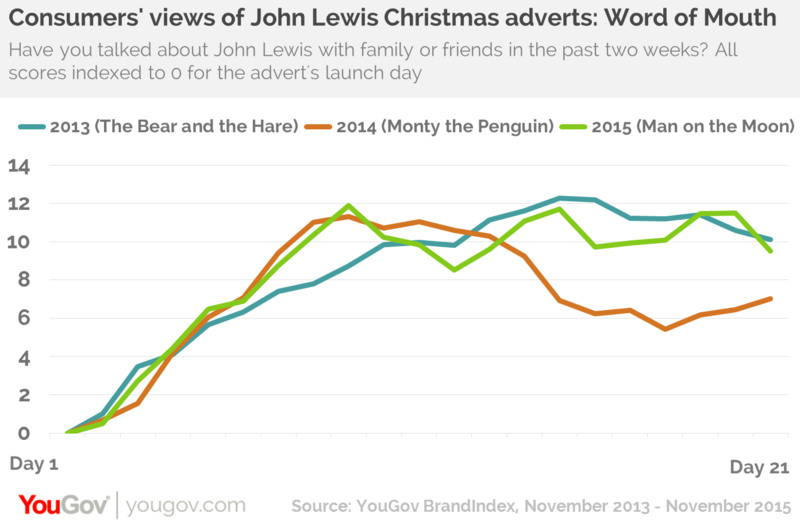 Taking the cumulative increases in ad awareness across the three week period, the Bear and the Hare comes top, with Monty the Penguin second Man on the Moon third. The second measure is word of mouth exposure. This measures how many people have talked about John Lewis with friends and family over the previous two weeks and is gives a slightly different perspective on the relative success of the different adverts. Again, the scores here are based on a one week rolling average and have been indexed. When it comes to talkability, it is a similar story to ad awareness. Both the 2014 and 2015 adverts got off to a strong start, while the 2013 spot was a slower, but steadier, riser. 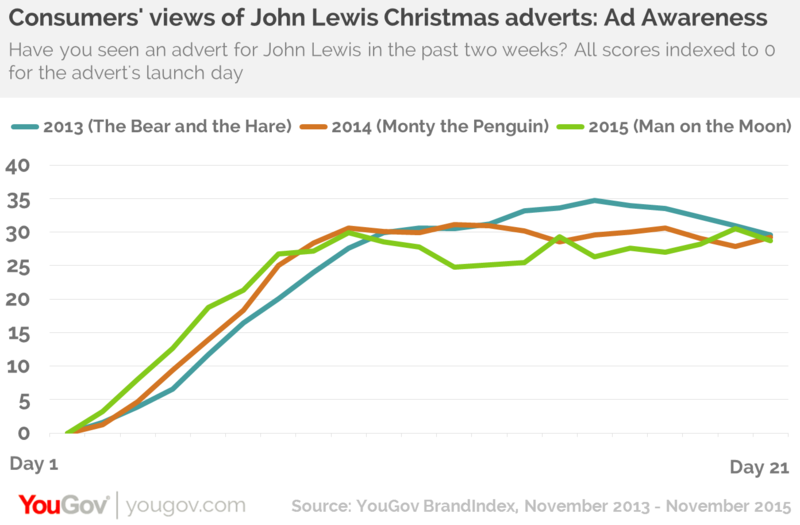 It is obvious from the chart that Monty the Penguin was a bit of a flop compared to the other two adverts, peaking early and then falling off quite a lot. While the Man on the Moon also peaked relatively early, it then plateaued, staying with the Bear and the Hare. Both the Man on the Moon and the Bear and the Hare achieved similar average improvement scores to each other. Monty the Penguin was notably off the pace. Naturally, how many people see an advert and how many people talk about it are not the be all and end all of a campaign, which are often as much about driving sales as boosting awareness and engagement with a brand. However, given the focus of the John Lewis ads is about making people feel differently and not explicitly about making them act differently in their purchase decisions, clearly softer metrics, such as engagement are important. While all three adverts we have looked at have been successful and would be the envy of most brand managers, there are hints that despite becoming a Christmas tradition, there are hints that John Lewis has not quite regained the heights it hit in 2013. As other retailers up their games and take the fight to consumers, it will be interesting to see whether John Lewis can recapture the magic of the Bear and the Hare.